We are Ahmedabad based Indian company involved in manufacturing and exporting of wide range of Ampoule Filling And Sealing Machine, Our range of ampoule filling & sealing machine includes Table Top Ampoule Filling And Sealing Machine, Single Head Ampoule Filling And Sealing Machine, Two Head Ampoule Filling And Sealing Machine, Four Head Ampoule Filling And Sealing Machine, Six Head Ampoule Filling And Sealing Machine, and high speed Eight Head Ampoule Filling And Sealing Machine. Our machines are widely used for the filling & sealing of glass ampoules. Our range of machinery majorly used by industries like pharma, cosmetic, chemical, biotechnology. 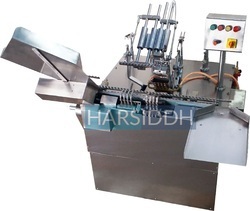 Harsiddh Eight Head Ampoule Filling and Sealing Machine as the name suggests equipped with eight head to fill injection liquids in 1ml to 10ml open mouth glass ampoules; having increased filling capacity from 0.5ml to 10ml in a single dose. 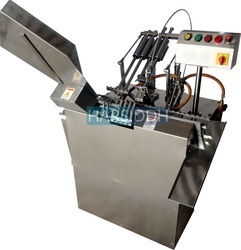 The machine parts are made of high-quality Stainless Steel for long lasting operations with low maintenance. 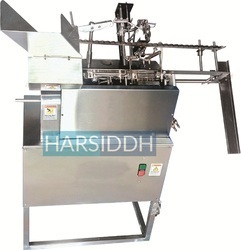 The machine is designed at Harsiddh for maximum output of 80 to 250 ampoules per minute based on the size. It uses the mixture of LPG and Oxygen for the sealing process. Pre & Post Nitrogen Purging is available with Preheating. All drives of a heavy structured compact unit are synchronized with a single motor. The unit is assembled with cassette magazine, smooth ampoule revolving unit, pre-heating unit, flow meters, variable frequency drive, vertical tray collection, pre-warming station, and other parts. It follows “No Ampoule No Filling” function and minimum change over parts from 0.5ml to 10ml ampoule size. The entire unit defined in a very flexible way for easy maintenance and full accessibility. Compact cGMP model offered by us is highly demanded in Pharmaceutical and other filling industries. ampoule Filler & ampoule Sealer is constantly evolved in our in-house research lab for better performance at all production stages. We also provide all possible industry-specific customization as on required at the client end. The most advanced and high-speed vertical ampoule filling and sealing machine with eight head is quite significant as far as the production capacity is concerned. Per minute output is 80 to 280 ampoules with 0.5ml to 10ml filling capacity in a single dose. Ampoule Filler And Sealer works well with the varied ampoule sizes ranging from 1ml to 10ml open mouth glass ampoules. Our ampoule filling and sealing machines having CE certificationsManufacture Precision:-Precise volume filling, minimum breakage, accurate quality sealing without defects and high reliability are the important functionalities. Heavy duty SS piping for jerk-free operations, Stainless steel cladding, epoxy paint and MS anti-rust treatment to plates (base, side, and middle) have made the structure sturdy for a long run. Operation:-Ampoules can be infeed through SS conveyor from a sterilizing tunnel and transfer them to a segmented wheel to carry on to a moving rack, which transfers the ampoules in a vertical position through the station one by one. The ampoules are discharged to the collection tray after sealing.Production Capacity can be varied based on the size of ampoules. 290 ampoules can be processed per minute for 1ml size. Similarly, if the size of the ampoule is 2ML than 270 Ampoules, 3ML 260 Ampoules, 5ML 240 Ampoules, and 10ML 150 Ampoules per Minute output can be achieved.Actual output can be ± 10 % depending on the diameter of ampoules. – Tolerance and diameter ± 0.25mm & height is ± 5mm. 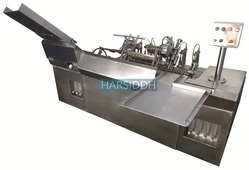 Harsiddh Automatic six head ampoule filling and sealing machine follows Angle Travel principle with improved filling capacity from 0.5ml to 10ml useful for varied ampoule sizes ranging from 1ml to 10ml open mouth. The machine equipped with six head increases the output up to 80 to 150 ampoules per minutes based on their sizes. Our six head filler & sealer is made up of sturdy SS heavy duty Material that are manufactured for long working hours. 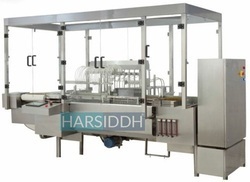 Harsiddh Sterilepack is well reputed Pharmaceutical machinery manufacturer had started the production with the ampoule filling machines, which are CE certified with DUNS numbers. Ampoule Filling And Sealing Machines are exported to various international destinations as on requirement. They are specially designed and tested in our in house lab. Our research engineers keep on adding the enhanced features to the equipment over the period. We also provide them with customization as on client’s requirement.Operation Process:The tray with sterile ampoules loads into the slant hopper. Ampoules push on one after another on eccentric rack with star wheel synchronization. Auto handling of pre-gassing, filling, post gassing, pre-heating and finally sealed in a sequential manner on stopping the rack. Completely filled and sealed ampoules are auto collected without human touch to avoid any contamination. The slant travelling ampoule filling and sealing capacity varies based on the type, thickness and neck dimension of ampoules. The machine is made up of sturdy SS materials with minimum change over parts and easy maintenance. Single motor placement synchronized all the drives causes’ smooth rotation of ampoules at sealing station. Automatic sensors stop the filling as soon the machine doesn’t found the ampoule.